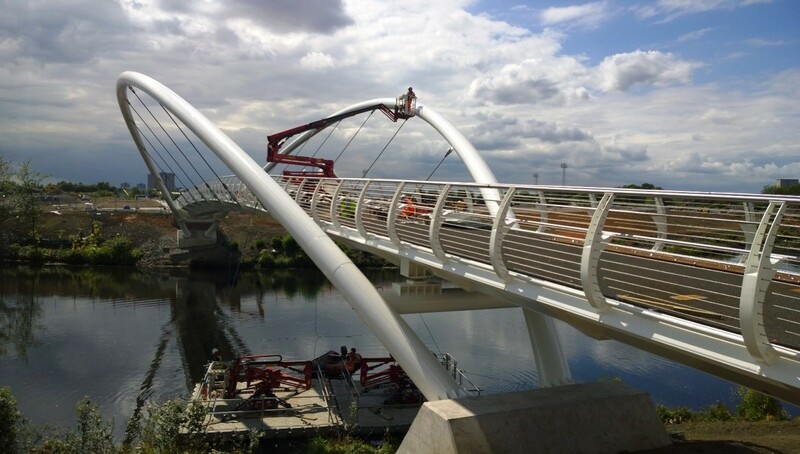 A £4.8m footbridge spanning the River Clyde is being readied for opening this weekend in a bid to improve connectivity between Shawfield and Dalmarnock ahead of the Commonwealth Games. 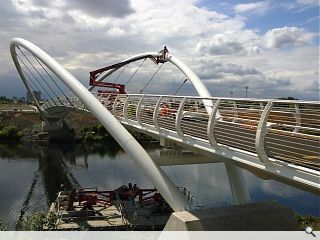 Designed by Halcrow on behalf of Clyde Gateway the scheme is referred to as a ‘smartbridge’ owing to the range of power, telecommunications and IT connections it hosts in addition to providing a pedestrian and cycle route over the river. Connecting directly to Dalmarnock Station through an ARES designed landscaped diagonal walk the scheme will halve walking time to neighbouring Shawfield and Rutherglen. It is hoped that the bridge will act as a catalyst in the ongoing regeneration of both banks of the river.